Edelweiss Franchise is one of the largest broking franchise in the country headquartered in Mumbai. 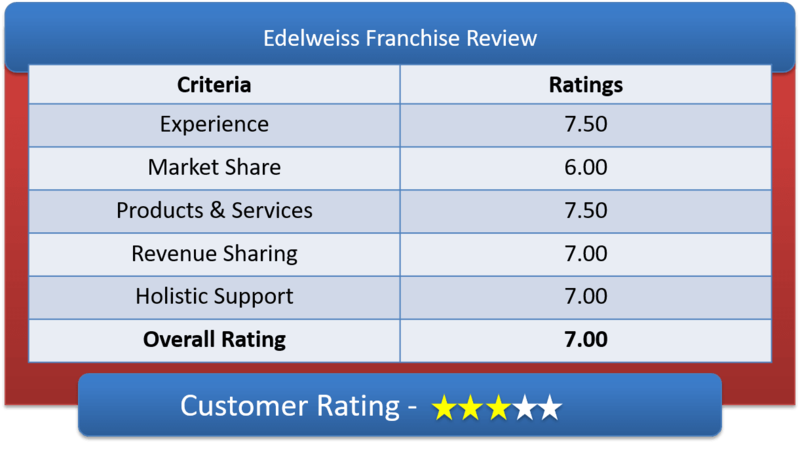 Lets have a detailed Edelweiss Franchise Review & deep understanding of Edelweiss Sub Broker Offerings, Edelweiss Franchise Revenue Sharing Models & other features of Edelweiss Partner Program. Edelweiss was found in the year 1995 as Edelweiss Capital Ltd. Its parent organization is Edelweiss Group. It is a Financial services providing company. It is head quartered in Mumbai (India) and has presence spread over 122 cities in India and abroad. Last year for FY17, grossed a net profit of over Rs. 600 crores and made good business deals, hence the future look brighter. They offer multiple platform for investment like Mutual Fund, Structural products, ESOP Funding, Housing Loan, PMS Insurance, LAP & LAS apart from primary and secondary market. It is registered under SEBI. Edelweiss is a registered member of BSE/ NSE/ F&O/ MCX/ MCK-SX/ NCDDEX and also a distributor of Mutual Fund that is registered under AMFI, apart from providing DP and Broking services. It does not provide the facility of Remisier and Introducers. But, they have come up with another idea called Elliance. In this type of partnership, both sub broker and the customer makes profits. The client must transfer Rs.5000 to his new Edelweiss Demat account. Client must buy new securities for a minimum Rs.5000 and these are credited in client’s Edelweiss Demat linked to this program. The office area should be 250 sq. ft. or more and preferably on ground floor or first floor. The office should be air-conditioned and drinking water facility, beverage, etc. The premises should only be used for Edelweiss products and services and its marketing. Lets have some detailed understanding on Edelweiss Franchise Revenue Sharing Model & their Initial Investment amount. For Edelweiss Sub Broker or Associate Partner Model, Edelweiss has a range a revenue sharing. It ranges from 60:40 to even 80:20 percent, depending upon the level of business a sub broker is generating form their client base. For a brand like Edelweiss, within two years of time one can easily get 70 percent of revenue sharing with a little hard work and effort. A Sub Broker can start the business initially by paying an amount of Rs 1 Lakh. But on an average, the total investment cost is around 2 Lakhs which is towards setting up the office and partly towards security deposit (refundable during exit). Depending on expertise, a franchisee will be given to trade in that particular segment. The monthly expense for every franchise would be office rent, electric, phone and internet bills to running the office and internet. The sub broker needs to have their own PC/laptop and a call recorder with min. one terminal. They also need to pay for registration Rs.2360 (non-refundable) per segment they want to trade into. 30,000 The Sub broker will receive a non-exclusive dealer for placing the orders. 30,000 – 75,000 The Franchisee get to sit with a terminal port & telephone. But sub broker will have to use their own PC or laptop. 75,000+ Partner get a sitting area, get a computer, terminal port & a telephone for trading purpose. Edelweiss use Omnesys software as a trading platform. They offer free of cost training for 90 days about process, products, software and trading platform. Edelweiss Franchise will provide with all the marketing collateral’s like visiting cards, banners, flex, posters, leaflets, boards, etc. All kinds of technical, customer care, training and management supports. They provide Call n Trade support 8am to 8pm for a better trading experience Edelweiss will provide their sub broker and their employees, a 90 days onboard training and assign a Franchise Relationship Manager (FRM). The FRM will teach everything about the products, software, platforms and all processes. In marketing support, the Management and Business Development Head can approve for up to 50% monetary help and other supports, but that depends upon the area, locality and the kind of event a franchisee is doing. If anyone wants to become an Elliance partner, they will provide a separate team for online product management. In worst case if the partner face any other difficulty, the higher management is always accessible to the partner. They will solve their problems on priority basis. Office branding support and marketing collateral’s for outlets. How to become partner with Edelweiss? To become a partner, a sub broker should have a good client base and a good risk taker. One should also be NISM certified in Equity, currency, derivative and capital market AND also a registered service tax person. The Franchise owner should have minimum of 2 years of experience in their offered products and also possess good understanding of stock exchanges, SEBI, commodity exchange, derivative and FMC. One should be a graduate. One can get registered with Edelweiss and receive the Franchise code within 12-15 working days to start his/her own business, subject to fulfillment of the above mentioned conditions. To smoothen the registration process, get the help of a chartered accountant to avoid any mistakes.